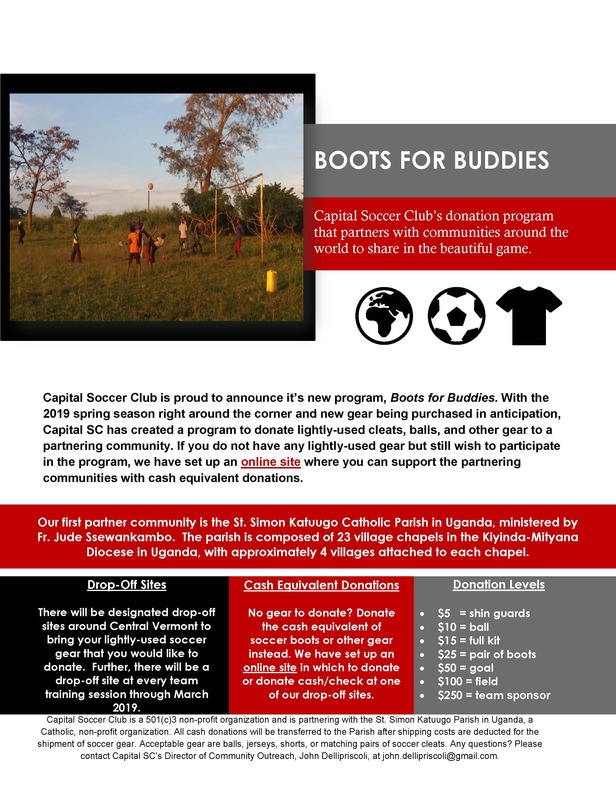 Capital Soccer Club is proud to announce it’s new program, Boots for Buddies. With the 2019 spring season right around the corner and new gear being purchased in anticipation, Capital SC has created a program to donate lightly-used cleats, balls, and other gear to a partnering community. If you do not have any lightly-used gear but still wish to participate in the program, we have set up an online site where you can support the partnering communities with cash equivalent donations. Our first partner community is the St. Simon Katuugo Catholic Parish in Uganda, ministered by Fr. Jude Ssewankambo. The parish is composed of 23 village chapels in the Kiyinda-Mityana Diocese in Uganda, with approximately 4 villages attached to each chapel. The children in the St. Simon Katuugo Parish love to play the beautiful game and Capital SC is thrilled to partner with this special community. All donations will go to support the Parish's soccer activities and operations!